BookingRobin can help you manage your schedule across multiple locations. You can keep different hours at each location, have clients choose where they want their appointment to be. 1. Add your locations under WP Admin > BookingRobin > Locations, including location name, phone, address and description. 2. Add providers under WP Admin > BookingRobin > Providers, including provider name, email address, phone, description and calendar color. 3. 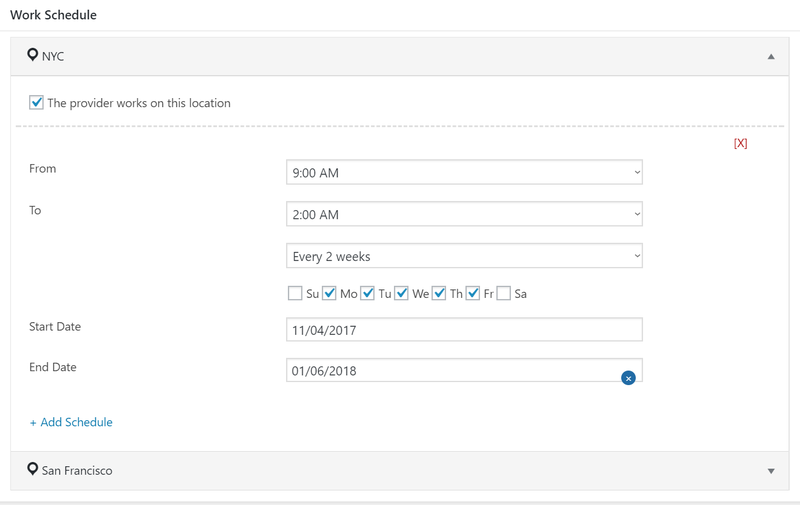 Set the days and times on each location your providers work in Work Schedule section. You may set work schedule frequency as every week or every two weeks. You may also specify schedule's start date and end date as needed. 4. Assign services providers can perform in Services section.